The road to El Sanctuario de Chimayo winds through ancient country roads in northern New Mexico, passing through Indian pueblos and tiny Hispano villages. Janice, Erik and I are midway through our vacation and we join other pilgrims journeying to the most visited Catholic shrine in the United States. There is a legendary Chapel of Healing Sands somewhere up there. I am told that during Lent and especially Good Friday, pilgrims journey on foot from as far away as Albuquerque toward this holy place. As we drive, we pass a bearded Latino man with a backpack. A pilgrim? We park in the vast parking lot, with plenty of room for buses of pilgrims. The day of our visit was the Feast of St. Francis and I thought there would be a crowd, but the feast was translated to the next day, a Saturday. Thus there were not very many people when we arrived mid afternoon. We climbed a long wheelchair access ramp, water gurgled in a nearby brook, wind rusteled the golden leaves of cottonwood and aspen. Autumn was transforming the mountain landscape. We passed other pilgrims leaving the shrine and they smiled at Erik. There was a noticeably alert hospitality toward the sick and disabled in this place as this is a place of healing. On a rock wall beside the brook, pilgrims had secured wooden crosses with the names of deceased loved ones. Erik and I arrived at the church and entered. As we sat in the front pew, a colorful array of folk-art works of holy figures/santos and wall decorations surrounded us. But where is the Chapel of the Holy Sand? After some prayers, we exited and I began exploring. I found a small door on the side of the church and entered. A chapel! All along the wall were hung crutches and other orthopedic support devices from persons healed. A poster board was pasted with photos of visitors. Had they received some kind of healing blessing? I walked further to a tiny door and had to bow as I entered the small space. In the middle of the floor was a hole about two feet wide and two feet deep, filled with sand. A man welcomed me to the place of Holy Sand and told me his story of how he had been suicidally depressed some years ago and came to this place and took some of the holy sand home and placed it under his bed. The next morning he awoke with a new spirit of hope and an inner voice that called him to minister to others who come to this place. Apparently, he has some sanction from the parish priest and has become a kind of official host. I exited and invited Jan to take Erik in there. After about a half hour they returned to me in the chapel courtyard, where I was minding our standard poodle Ella. Jan said that the host invited Erik to stand inside the hole of healing sand. He and two other persons encircled Erik with prayers. At some point Erik, who is not that verbal, said, “This feels good “and laughed. The host gave Jan a large plastic bag of the holy sand to take back home to share with others. In the past people have rubbed their bodies with the sand and prayers for healing. Apparently, something has happened here over these 200 years, because people continue to come here for healing. Janice and I respectfully joked that after this event, Erik, who is mentally 3-4 years old, was now able to do simple multiplication. Of course, that was not true. However, our family could sense a holy presence there in the Chapel of the Holy Sand. We remember the many years of Erik’s hospitalizations and great physical suffering. Things have stabilized for him and we are grateful for every day we have with him. He was a wonderful, receptive traveler during our vacation journey. Of course he had our presence and attention 24 hours a day. The day of our visit was a mild, beautiful autumn day. Four days after our visit, it snowed! Holy Week 1995. Frantic, busy planning for the all details of fifteen different masses and liturgies. Erik sat at the breakfast table eating his oatmeal. “Jan, Erik’s left eye is red and all puffy. What do you think that means?” My wife, the family nurse practitioner, looked carefully at the eye and said, “Oh.Oh.Trouble.” He seemed to have activated the herpes in his eye that was connected to his catastrophic encephalitis back in 1987. After an emergency visit to his pediatrician, we drove up in the USC Doheny Eye Clinic in Los Angeles with an appointment with the clinic head, Dr. Rao. Erik needed IV acyclovir, as immediate intervention, because the retina in his left eye had detached, with potential blindness. Erik’s health can take a drastic turn with a flick of the fingers. Dr. Rao wanted to put Erik in the hospital for the IV infusions, but Jan said we would do this at home. It meant treatment every six hours, hanging an IV bag from a wooden step ladder. The anxious concerns about planning for Holy Week quickly faded to the background. Erik was now undergoing his own Passion. What a trooper he was and is, patiently allowing Jan to prick and probe his skin, apply many eye ointments over two weeks of intensive treatment at home. We returned to the Doheny Clinic after this treatment at home. Dr. Rao carefully looked into Erik’s eyes with his complex scopes. “How does the retina get reattached, if it disconnects?” I asked, the man always with many questions. “Surgery. It is like sewing very thin Saran Wrap. Doesn’t always work.” Now he was very quiet. I need to shut up and wait. He goes off to a corner, rubs his chin. “This is very curious. The retina has reattached on its own. I don’t think I have ever seen anything like this.” Again my questions: “How could that happen?” He looked at me, smiled and said, “You are the priest, aren’t you? You should be telling me.” Erik’s retina had reattached. I began seminary in Berkeley in 1967. Over those three years, tumultuous years in the city and America, I studied scripture, theology, and pastoral care. The rational, skeptical mind was cultivated, plumbing the depths of Christian thought and doctrine. I entered seminary full of passion and love for God. I graduated, having cultivated academic knowledge, supposedly prepared for parish ministry. At my first parish, St. Mary’s Laguna Beach, we had a healing mass every Thursday. Parishioners came to the altar rail for anointing for healing for themselves and others. I went through the motions with sincerity, but did I believe that God heals? Over these forty-three years as a priest, I have anointed hundreds of people with blessed oil, praying persons through surgeries, chemotherapy, and in the last breath of life. I am grateful that God’s Amazing Grace has softened those skeptical spirits within me, as the sick and dying have held my hand, and their spirits have infused me with their faith, and the Passion of Jesus on the Cross has enfolded all of us with the hope of ultimate healing, wholeness and resurrection. 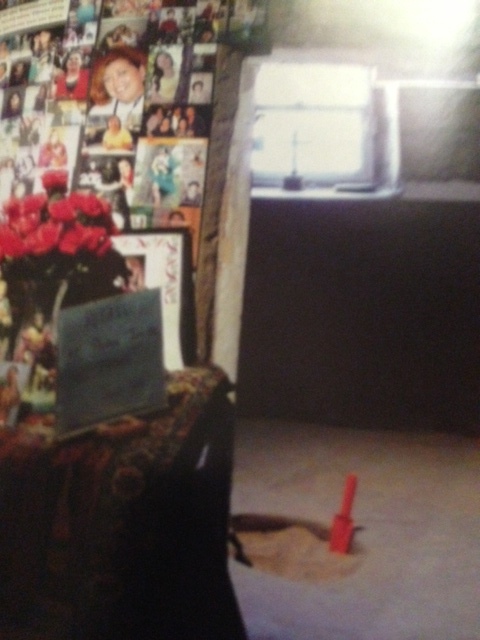 My most significant memory of God’s healing presence is the memory of bringing weekly communion to the home of Chad DeLeeuw, in 1988, when he was slowly dying of AIDS. Each visit presented a human form, more thin and weak and wasted from the last visit. But his hunger for the Eucharist and my prayers were strong. Breath labored, he would pray the Confession and Lord’s Prayer very slowly. Chad was experiencing his own Passion, but his heart and eyes were looking East toward his Resurrection and ultimate wholeness with the Lord. I brought him the love of a Church that cherished and blessed him, just as God had created him. 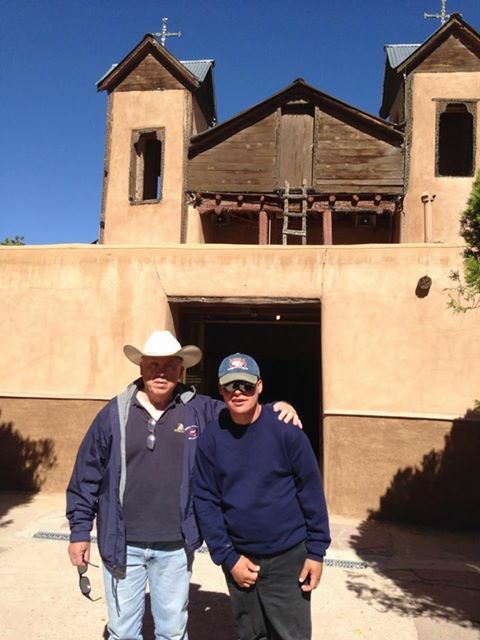 This entry was posted in Blog and tagged AIDS, Catholic shrine, Chimayo, healing prayers, healing sand, New Mexico, Passion of Jesus, St. Francis. Bookmark the permalink. Beautiful Fr. Brad! I thank God for you & being there for me during a most difficult time in my life. Many blessings upon you & your family!